There is really something quite special about walking your dogs in the UK this time of year: Blackberries! There is nothing better than picking a couple of handfuls was you walk along, taking them home and cooking yourself a pudding. Even better they are free! 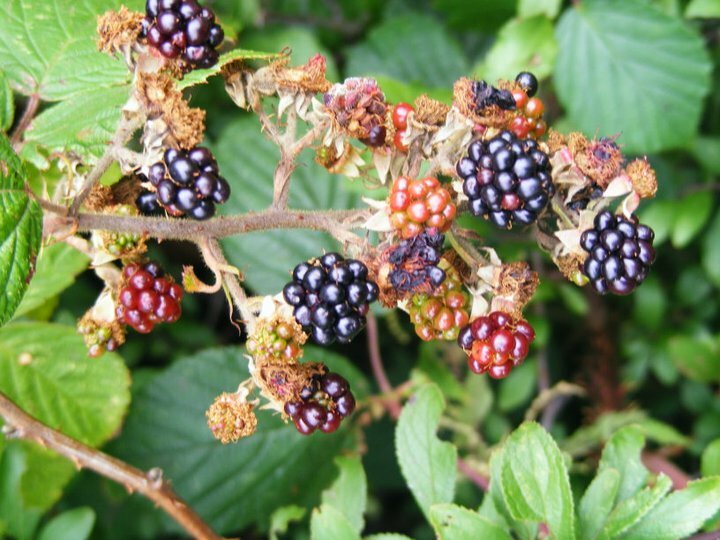 It has to be said, however, that the blackberry crop has been very disappointing this year due to the late frosts and unpredictable rainfall. Still, I’ve managed to pick just enough over the last couple of weeks to copple together a crumble. You know how people always ask you “if you were on death row, what would your last meal be”? Well, I’ve mentioned before that I would always say apple crumble. I have to say though that my apple and blackberry crumble would come a close second! This recipe includes a teaspoon of cornflour in with the fruit. As the blackberries burst their gorgeous juices mix with the apples and cornflour and form a mouth-watering fruity jam. It really is something special! I would like to say this is a low-fat, calorie counting recipe but I would be lying! I have managed to lose over a stone in weight, however, so I think I deserve a little treat and it does have fruit in it! I’m not even going to have custard with it just a little blob of low-fat whipped cream. I’m being really good because I can hear the custard calling to me!! “Eat me, eat me!” it says. Toss the apples, blackberries together with the sugar, cinnamon and cornflour. Place in a ovenproof dish. Rub the flour and butter together until they resemble breadcrumbs. Stir in the sugar, cinnamon and oats. Cover the fruit with the crumble topping. Bake in a preheated oven at 180 ◦C for 30-40 min or until golden brown. including flaked almonds or mixed nuts. This crumble topping is brilliant for any fruit crumble. It also freezes well so you can make up double the amount and freeze half for a later date.